We spent 10 nights at Cae Mawr Caravan Club site during the Easter holidays, 2010. We left St Helens on the morning of Sunday 28 March and took the A570 and A557 to join the M56 westward at Junction 12. At the end of the M56 we took the A5117 and joined the A55 Expressway near Queensferry. This is an excellent route as it is all motorway and dual carriageways all the way to Anglesey. We crossed the Britannia Bridge and immediately turned north onto the A5025 towards the village of Benllech. We continued through Benllech on the A5025 for a little over a mile and then turned left onto the B5110, signed Llangefni. The entrance to Cae Mawr Caravan Club site is on the right half a mile further on, immediately after the Parciau Arms Public House. The entrance drive to the site is quite narrow in places. We had travelled 98 miles. We found the site quiet and pleasant and well-located close to the main road for travelling around Anglesey. The site was made more attractive by a number of colourful flower beds. The wardens were, then, new to site but they were very friendly and helpful. The site 6.5 acre site has a total of 76 pitches including 33 hard standings all with EHU. It has 2 main pitch areas and we stayed on pitch 12, on the left between the 2 main areas. We chose that hardstanding pitch as it faced east and I wanted to try out our new satellite system – it worked very well when I finally got the signal!!! The site has no toilet block. There is a dog work along the boundary of the site, commencing at the site entrance, but it was VERY muddy during our stay. We really prefer sites with a bit more of a view, preferably sea or lake, than Cae Mawr, but given the windy weather it’s sheltered position was a bonus. Although we are not great TV watchers it was good to have the satellite option as the weather was extremely variable. Over our 10 day stay we experienced rain, sleet, snow and high winds. In fact for the last couple of days we took down the satellite tripod as the winds were gusting to gale force. We still had the freeview box and the ‘van’s Status 530 aerial which worked fine. Despite the sites sheltered position 2 of our neighbours had trouble with their awnings. The awning on the caravan pitched opposite us had its awning torn from the beading by the wind. The owners were out for the afternoon and we helped gather it up. We, also, helped the caravanners pitched next to us take down their awning as they were struggling to do so in the gusting wind. Although the weather was changeable we did have some sunny spells. There was a pub adjacent to the site entrance but we did not try it. There a few shops including a couple of small supermarkets and a chip shop in nearby Benllech. This small town was handy for a spot of food shopping and fish and chips one night. The weather at the beginning of the week was quite wet and windy. On Tuesday we drove around the north eastern corner of Anglesey. We visited Red Wharf Bay for a short while but it was rainy and not really beach weather. We continued to Beaumaris. This pleasant town Victorian town of pastel house overlooks the Menai straits and Bangor and the coast of the mainland beyond. The medieval castle, which dates back to the reign of Edward 1, is dominates the northern end of the town but we did not visit it on this holiday. We spent a little time looking around the around and visited some of the shops. We, and Max the collie, enjoyed several walks. 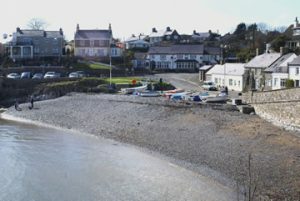 On Thursday 1 April we drove to the village of Moelfre and parked in the village car park. We then walked around the picturesque harbour before taking the coastal pathway northwards. This walk gave lovely views back over the sea to the snow-capped mountains of Snowdonia. As well as the lovely coastal scenery there were a number of interesting sights on this walk. We passed the Seawatch centre but this did not open until Easter. It houses a shop and a small museum dedicated to life in the local area. 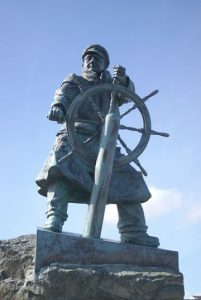 Outside the Seawatch centre there is the stunning bronze sculpture of Dic Evans a former coxswain of the Moelfre Lifeboat dedicated to the bravery of the Moelfre Lifeboat crew. The sculpture by sculptress Sam Holland was unveiled by the Prince of Wales in 2004. The life-size likeness of Dic Evan gripping the wheel of his lifeboat while gazing out to sea is very striking. Nearby on the shoreline is the memorial to the ship the “SS Royal Charter” which was lost on the nearby rocks in 1859 with the loss of 454 lives. We continued along the grassy coastal path for a couple of hours before turning and retracing our steps back to the car. On Friday 2 April the weather was wet and rainy and so we amused ourselves reading and watching the TV in the caravan. On Saturday 3 April the weather had brightened and we drove to visit the pleasant market town and County town of Llangefni in the centre of the island. Llangefni has a good range of independent shops and Aldi and Lidl supermarkets. The extensive Saturday outdoor market had a varied and interesting range of stalls, including a number selling locally produced crafts and foodstuffs. The town is pleasant location on the banks of the River Cefni. Taking advantage of the better weather from Llangefni we continued driving across the island to the Newborough Forest on the south coast. There is a coin-operated barrier on the road to the forest’s car park near to the beach and so it is important to have some change. 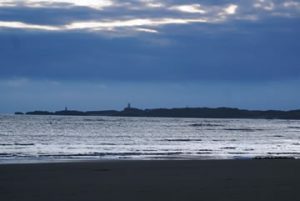 Newborough Forest, which is managed by the Forestry Commission, consists of pinewoods with stretch right to the edge of the beach. We parked in the car park, which is close to the beach, and spent a pleasant evening walking along the beach to Abermenai Point. The mountains of Snowdonia made a beautiful, snowy backdrop across the Menai Straits. Our best day weather-wise was Easter Sunday and so we made an early start and returned to the car park in Newborough forest. 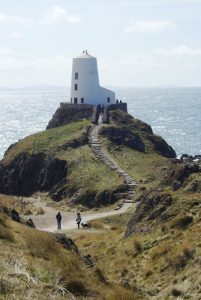 We had planned a walk north along the beach to Llanddwyn Island. 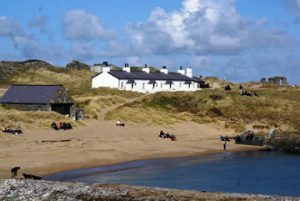 Llanddwyn Island is actually a narrow, rocky promontory which is accessible from the beach at all but the highest tides. 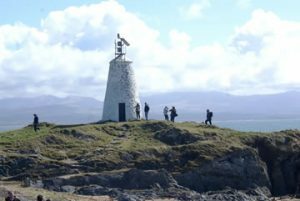 Llanddwyn Island is popular with walkers and there were a number of other walkers on the island that Sunday. We walked to the far end of the island, thoroughly exploring it on the way. This small island is managed as a nature reservation by the Nature Conservancy Council and there are a number of well defined footpaths. There is a large Celtic cross near the path which commemorates the graves of a Church which was once situated there. The island is home to a number of white horses and a flock of Soay sheep, an ancient Welsh breed. We then enjoyed a picnic lunch sitting on a deserted beach on the western side of the island. At the far end of the Island there is an attractive row of white-painted cottages which, in the past, housed the pilots who guided ships into Caernarfon harbour. At the point of the island there is beacon tower (1800) and a small lighthouse (1845) which superseded the beacon tower. From the point there are stunning views east to the mountains of Snowdonia and south to the Rivals (mountains) of the Llyn Peninsula. Under the lighthouse there is a lovely bay of fine sand which was populated by a number of canoeists whose brightly coloured canoes made a colourful photo. We enjoyed a very pleasant picnic lunch on one of the island’s sunny and secluded beaches before retracing our steps to the car. As the afternoon continued bright and sunny we drove back across the island to Beaumaris again. We took a stroll along the promenade and onto the Victorian Pier but by then it had clouded over and it had become cold and windy. To complete our day we drove along the A545 coast road, with its lovely views over the Menai Straits, to the Town of Menai Bridge. At Menai Bridge we turned around and drove back along the coast road before returning to the caravan. On the Easter Monday 5 April we packed up the caravan and prepared for our journey home. We left on the morning of Tuesday 6 April and drove home to St Helens by the reverse of the route of our outward journey. We made good time and arrived home safely during the afternoon. Header banner image credit to the original uploader Nabokov at English Wikipedia. [CC BY-SA 3.0 (https://creativecommons.org/licenses/by-sa/3.0)], via Wikimedia Commons.